“Quiche is one of our favorite ways to get a quick, nutritious meal on the table with ingredients we usually have on hand. It is great for breakfast, brunch, lunch, or dinner! 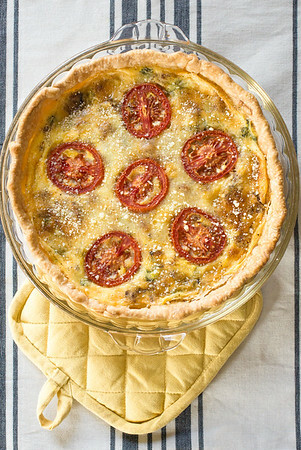 Fill your quiche with your favorite veggies, meats and cheeses, you can use a variety of crusts (homemade, refrigerated, or frozen), thinly sliced or grated potatoes, or no crust at all. Paired with a green salad and fruit and it is sure to please your family and friends. This Spinach Quiche is my family’s favorite combination!” - Wendy Cannon, a Cooking Instructor at the Doctor Yum Project Kitchen. Preheat oven to 450 degrees. Bake pastry shell 7 minutes or until lightly browned, rest on cooling rack. Reduce oven temperature to 350 degrees. Cook and crumble bacon, reserve two tablespoons of crumbled bacon and put the rest in the bottom of the pie crust. Saute chopped onion until soft and lightly browned, in a small amount of bacon grease. Add chopped spinach and saute. Spread onion and spinach mixture evenly in pie crust. Finally, add grated cheese over the spinach mixture. In a medium bowl, whisk eggs, milk, flour, salt, pepper, and nutmeg. Pour egg mixture into pastry shell. Use a fork to make sure veggies and cheese are covered. Sprinkle remaining bacon and arrange sliced tomatoes on top. Bake at 350 degrees for 45 minutes or until egg is set and inserted knife comes out clean. *to keep crust edges from getting too brown, cover with pie shields or strips of aluminum foil.